In the default workflow model, jobs are linked to Projects, not to Clients. The "New" button for jobs is found in the "Client jobs" tab of the general "Projects" list. 1) Click the Projects tab at the top of the screen and the "Project" button. 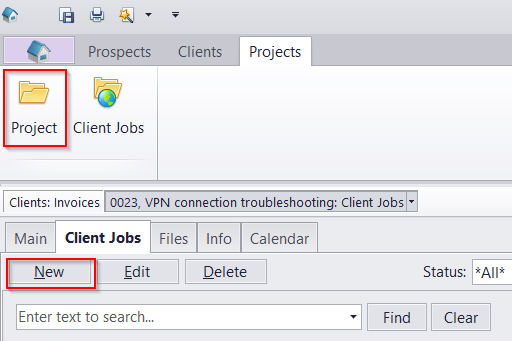 2) In the window that opens, select the required project, and click the "Client Jobs" tab. Alternatively, you can switch to the "Without Projects" workflow mode, in which case the "New" button for client Jobs will be found in the "Client Jobs" tab of the client. 2) Go to "Advanced Settings >> Workflow mode"
3) Select "Without Projects mode" and click "Set now"